In the 1980s, when the population was a fraction of what it is today, it was the Lake Patrol. It existed to help stranded boaters, tow people when their boats broke down, and sometimes just check on people. “There was an older woman who lived on a cove out on Meck Neck,” says retired officer Bud Williams. “She’d see our boat coming and start putting out the cookies and milk. We helped an old man move the TV in his house, and another gentleman who just had heart surgery, we shoveled the snow out of his driveway,” Williams chuckles. Harry Garrison is another of the original members of the Lake Patrol, retired now, and living in Mint Hill. He remembers duty on the lake with fondness, though he cautiously says he “liked the lake when it wasn’t quite so developed.” He is glad not to have to be chasing down scofflaws like the officers of today. In the early days of the 1980’s, Vick Orr, a Mecklenburg County Police Chief became the unit’s first Captain, and patrolled all three lakes. “On Wylie, the Lake Patrol had an old tri-hull with an old Chevy engine,” says Officer Howard. “I remember trying to chase someone in that thing!” he chuckles. On Lake Norman, a boathouse wasn’t completed until 1982. Howard says officers had to trailer the patrol boat up from the Charlotte County Garage every day that year. Prominently in a long list of trainings, officers must attend the long Coast Guard Auxiliary course; they must be certified EMT’s who go on calls once a month and have continuing re-education in life saving techniques; and they must be certified in swift water rescue. Naturally, boating experience and excellent swimming ability (yes, there is another test) is a requirement for the job. Today, Charlotte-Meck Lake Enforcement has 4 full-time officers covering Lake Norman and Mountain Island Lake, and 3 full-time on Lake Wylie. 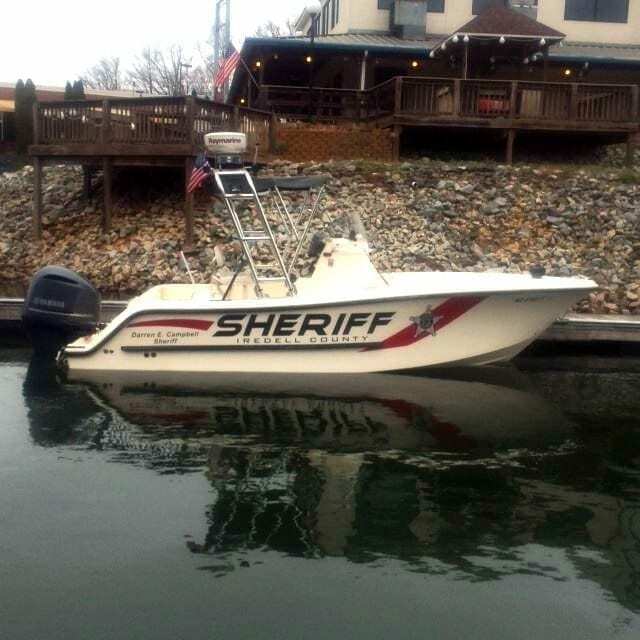 In addition, there are 4 seasonal officers on Lake Norman and 1 on Lake Wylie who work May through October. Howard says one of the Lake Norman unit’s consistent accomplishments is keeping equipment so ship-shape that they kept their first patrol boat for 16 years, finally replacing it in 1997. Now they have two additional auxiliary boats and two jet skis, along with a citizens-on-patrol boat manned by civilians. It can get pretty hot on the lake in summer, and uniforms didn’t always match conditions. Howard says in the early 80’s “officers wore the full PD uniform, even the wool blend pants, with uniform shirt, badge and name tag. No shorts! It wasn’t considered professional enough,” he says. They progressed to gray work pants and a golf shirt. “Then by the mid-90’s, we said, ‘We’d like to get some shorts with those golf shirts!’ Our first shorts were cotton, and they would never dry,” he says. Today, they ride jet skis and wear quick-drying shorts, wet shoes, and an ear mike communication system. He says boaters often drive right up on a shoal with the marker right in front of them, ripping the bottom out of an expensive boat, just simply because they don’t know what the signage means and haven’t bothered to learn. “’Shoal’ means ‘there’s a shoal right here’, and you can’t be going between the marker and the land.” Howard shakes his head. Lake Enforcement says according to national statistics 70% of all boat accident victims have no formal boating education. And on routine boat checks, when officers check for safety equipment, like fire extinguisher and personal flotation devices, they find that more than 90% of weekend boaters do not live on the lake. “That makes for some scary situations, just because they haven’t bothered to educate themselves,” he says. “It’s irresponsible. Irresponsible and lazy can kill you or someone else,” Howard observes. He believes boaters should be licensed, just like drivers, with a safety course required. He wishes that legislators in Raleigh would take lake boating as seriously as they do ocean-going craft. So what’s Lake Enforcement’s proudest achievement? Sgt. Burnette, whose tenure has seen not only a change of name and focus, but the training, the uniforms and the boat to go with it, says he’s proud of his unit’s community outreach. “We’re continually looking for ways to improve and develop partnerships with the Lake Norman community,” says Burnette. An example is their Red Cross Water Safety Program for 3rd graders, called Whale Tales. They teach water safety in 3 schools now. Kids get a ‘Junior Officer’ sticker at ‘graduation’ along with water safety workbooks. “We’re dedicated to providing the best training and equipment on the lake,” says Burnette.